← Struggling to lose that stubborn belly fat? Once I truly understood how completely toxic oils such as sunflower, safflower and canola were for you, I started reading food labels very carefully. Almost EVERYTHING that is processed and packaged has these vegetable oils in them. Biscuits, margarine, salad dressing and mayo to name just a few. I know, I know we have all been brainwashed into believing that these vegetable oils are better for you than “artery clogging saturated fat” such as butter, coconut oil and lard. But nothing could be further from the truth – on both counts! Saturated fat does NOT clog your arteries and is in fact good for you and vegetables oils are bad news. Vegetable oils are oils extracted from seeds like the rapeseed (canola oil), soybean (soybean oil), corn, sunflower, safflower, etc. They were practically non-existent in our diets until the early 1900s when new chemical processes allowed them to be extracted. Studies have now demonstrated that these oils can cause serious harm. The composition of these oils is different to anything we have ever been exposed to throughout human history and is leading to physiological changes within our bodies and contributing to multiple diseases. Summarised from an article written by Kris Gunnars from Authority Nutrition blog. These oils are very unnatural and are just not fit for human consumption. The way these oils are processed is really disgusting and involves pressing, heating, industrial chemicals and highly toxic solvents. It is amazing that humans have been eating real, natural butter for thousands of years, yet in the past few decades we have been told it will kill us and that we must rather eat fake food. What ever possessed us to listen to this tripe, especially since there is no science to back up the claim? Vegetable oils contain very large amounts of Omega-6 fatty acids, which are harmful in excess. Our bodies need both Omega 3 and Omega 6 fatty acids, but in very specific quantities. Without this fine balance and correct ratio, things start going horribly wrong with our bodies. Excessive consumption of vegetable oils leads to actual structural changes within our fat stores and our cell membranes. And, it is easy to consume too much as it is in everything – another reason to avoid processed as well as fast food. Vegetable oils contribute to inflammation in your body. Having chronic, systemic inflammation all over your body is now believed to contribute to various serious diseases, including cardiovascular disease, arthritis, depression and even cancer. Whereas saturated fats were once considered to be key players in heart disease, newer studies prove that they are harmless. Vegetable oils are loaded with toxic trans fats. They are so bad that even the governments around the world have started taking action, setting laws that command food manufacturers to reduce the trans fat content of their foods. If you want to reduce your exposure to trans fats, it’s not enough to avoid common sources like cookies and processed baked goods, you also need to avoid vegetable oils (like that sunflower oil that you fry your chips in at home). Eat butter instead of margarine. Make your own salad dressing using extra virgin olive oil. Fry your food in coconut oil, lard or duck fat. Bake your own goodies – without vegetable oils, and avoid packaged biscuits and cakes. Oh and definitely make your own mayonnaise (see recipe below). Now my kids love mayo. They will eat it with almost anything. But knowing what I know, there was no way I was going to let them have store-bought mayo. You wouldn’t give your kids a cigarette to smoke, because we know that smoking is bad for you. Well for me vegetable oils fit into that same category of “things that are very, very bad for you”. So, I have started making my own mayo – and it is way more delicious that anything that you can buy in the shops. Here is a full-proof recipe that I use for homemade mayo, which I make in my blender in a few minutes. 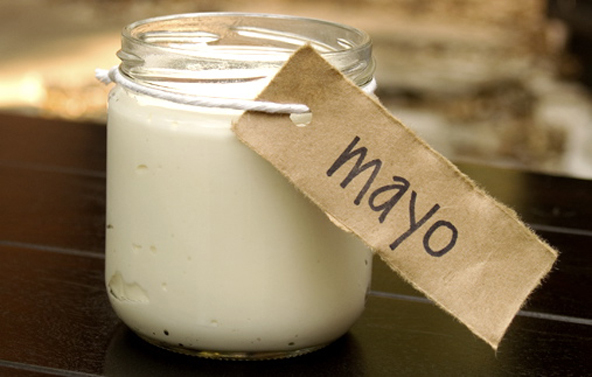 Click on this link Paleo Mayo for a printer friendly PDF version of the recipe. Authority Nutrition. Check out this blog if you want links to various studies which back up all the above statements. Posted on May 24, 2014, in Primal 101 and tagged homemade mayo, toxic oils, vegetable oils. Bookmark the permalink. 1 Comment. Looks good -but the easiest way to make this is to put everything into a jar with a mouth wide enough to take a stick blender -and blend lifting the blender towards the top of the jar (without letting it become uncovered) -same delicious mayo but far less mess and washing up!